SASKATOON — There is a man in a grey suit who smiles freely and greets guests on the banquet level some late evenings. I haven’t had the pleasure of meeting him, but there’s time yet. He and I are at the Bessborough in Saskatoon, one of the last of Canada’s grand railway hotels. The nation’s tradition of rail hotels began in Montreal, the home of Canadian Pacific Railway president William Cornelius Van Horne. The Windsor went up in 1878 and the CPR and other companies followed with the Hotel Vancouver, the Banff Springs Hotel, Quebec City’s extraordinary Château Frontenac, and other beasts of brick and stone along thousands of kilometres of rail. Fourteen hotels later, Regina saw the rise of the Hotel Saskatchewan in 1927. It’s not like Regina didn’t deserve a grand hotel. It was a vibrant, growing city that had been built by the railway. But so was Saskatoon, and this city wanted one, too. The CPR went through Saskatoon, 300 kilometres north of Regina, and had since 1908. The city boasted an elegantly long and tall rail bridge with a pedestrian walkway as well as a sleek little railway station. Called the Hub City, Saskatoon also hosted track for Canadian National Railway and the Grand Truck Railway. All it was missing was a grand hotel, and CNR stepped in to make that happen. So within a year, ground was broken for the 10-storey Bavarian castle-inspired building that overlooks Saskatchewan River. 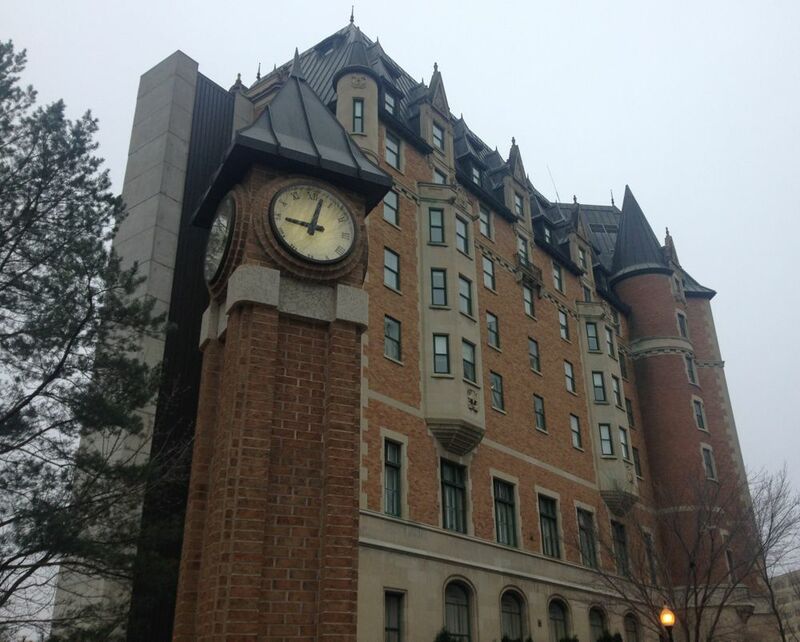 Designed by Montreal architects, it integrated turrets, heraldry, gargoyles and other stonemasonry under a copper roof. Sir Vere Ponsonby, the ninth earl of Bessborough and 14th governor-general of Canada, consented to have it named in his honour. It was 1932 when building was completed, and the Depression was hitting the Prairies hard. The doors of The Bez wouldn’t officially open for another three years. It has aged elegantly. The gardens with their ironwork gates and heart-shaped flower gardens lure lovers and the river just beyond keeps the castle separate from the rest of the world and dampens the noise of traffic and passersby. Bellmen rush to open doors before a guest has the chance to reach out their chilled hands. In the wide hallways, carpets muffle the sound of dress shoes and high heels. Chambermaids stop what they’re doing to say hello and ask after one’s day. The high-ceilinged banquet area features palatial windows with luxurious curtains, dark wood accents and chandeliers. It was once a quiet space for gentlemen to sit and sip coffee, read their newspapers and gossip, as men do. Here is where one might see the man in the grey suit. He is an older gentleman, and he is wearing a fedora. His countenance is so still and friendly that people who meet him often don’t realize till after they’ve returned his greeting that he isn’t there at all. No one knows who he is or when he was. A legend that sticks is that of a hotel employee who was tasked with asking a group of guests to settle down one evening. Two men at the party did not take kindly to the admonishment and threw the employee over a railing. He fell several storeys to his death. That tragedy is marked by a crack in the ballroom floor. And perhaps by a man in a grey suit and fedora.